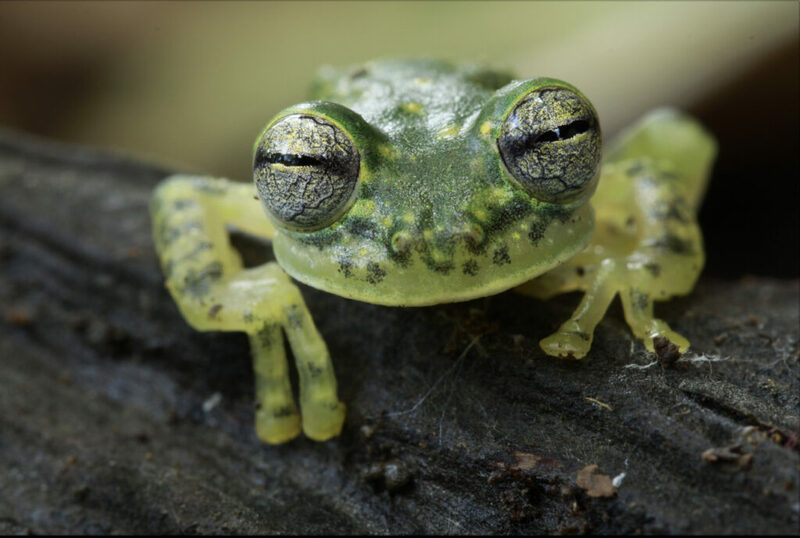 The Puyo Giant Glass Frog is relatively large for a glass frog of the Nymphargus genus, with bright green skin and yellow-green spots. There are dark green reticular markings on the limbs, and the eyes are a pale blue-green with a green-brown bar running horizontally across it. The underside of the frog is a transparent green-white, as is characteristic of glass frogs. It has not been studied sufficiently to confirm its behavioural habits, but from the study of similar species it is assumed to reproduce by laying eggs on vegetation overhanging rivulets or streams in lower sub-montane forest. Once the eggs hatch, the tadpoles fall into the water, where they develop into their adult form. It has only been recorded in the lower-sub-montane forest on the Amazonian slopes of the Andes, in Ecuador. 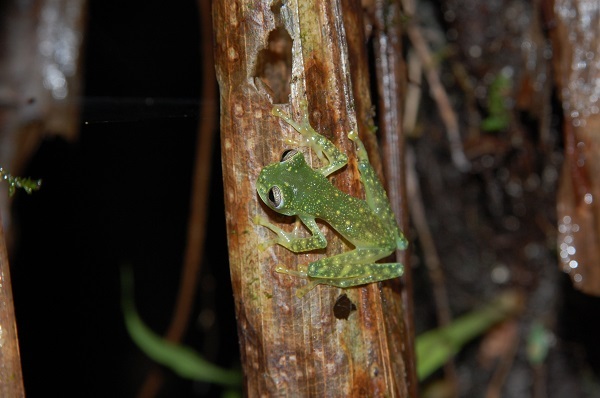 However, it has been proposed to be the same species as Maria’s Giant Glass Frog, another giant glass frog with a small range in the Andean cloud forests of Peru. The primary threat to this species is the destruction of its habitat due to agriculture and logging. Only ten per cent of the remaining foothill forests of its historic range are protected within the Ecuadorian Protected Areas System. Coloma, L.A., Ron, S., Cisneros-Heredia, D. & Angulo, A. 2009. Nymphargus puyoensis. The IUCN Red List of Threatened Species 2009: e.T54936A11229075. Flores, G., & McDiarmid, R. W. (1989). Two new species of South American Centrolenella (Anura: Centrolenidae) related to C. mariae. Herpetologica, 401-411.